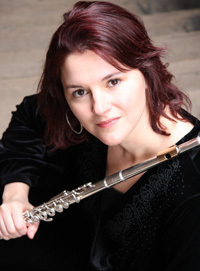 Colleagues and critics alike regard flutist Maria Harding as an “artistic anchor” and “a truly remarkable musician”. She is one of today’s most notable orchestral flutists, receiving much attention for her beautiful tone and her expressive and colorful phrasing. Principal Flute of the Omaha Symphony since 1997, Maria began her orchestral career at age 16 in the Lubbock Symphony Orchestra, under the baton of Gurer Aykal. She has played with the Saint Louis Symphony, the San Diego Symphony, the Kansas City Symphony, the Schlossfestspiele Orchestra in Heidelberg, Germany, and has held the position of Principal Flute with the Charleston (SC) Symphony Orchestra. As a soloist, at age 18 she was awarded first prize in a competition sponsored by the National Flute Association. She also took top awards at the McCarty Young Artists� Competition and the Myrna Brown Competition. The Yamaha Corporation quickly took note of her talent and named her a Young Performing Artist, and later an Artist/Clinician. Through this program she currently serves as a musical coach of young players in music clubs and university programs across the country. In addition to her full-time orchestral schedule, Maria gives over 30 solo performances a year. Locally, she dedicates considerable time bringing music to Omaha senior centers, children’s hospitals, and hospice facilities. Maria enjoys a large and lively private teaching studio, with students ranging from beginners through emerging professionals. She hopes to perpetuate the caring guidance she received from her own fine teachers: Margaret Redcay (early studies), Bonita Boyd (Eastman School of Music), Bradley Garner and Jack Wellbaum (Cincinnati Conservatory of Music).